We can reproduce you logo or custom idea and provide a custom rhinestone shirt. Just provide the graphic and we will do the rest. We specialize in custom rhinestone shirts. Let us quote your next project you will be surprised how affordable custom rhinestone apparel is. We can place you custom rhinestone design on shirts, hats, jackets, jeans, bags, aprons and so much more. 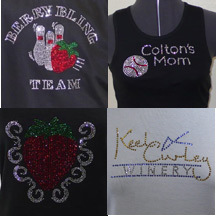 If you know what you want Click Here to make your custom rhinestone shirt. Choose the Shirt, Saying, Graphic, Color Rhinestone and we do the rest. Ships 2 -3 business days from placing the order. We use Bella shirts - They are 100% cotton ladies tees. If you want your custom rhinestone design on a different shirt just let us know. 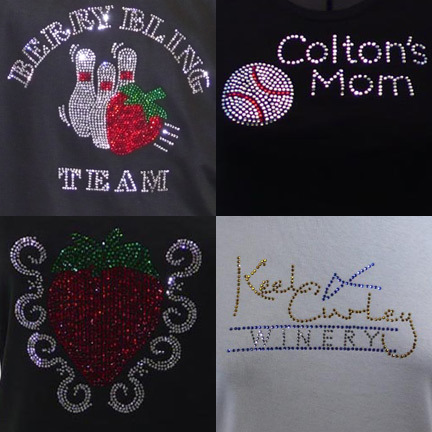 We have our own rhinestone equipment and can put your design on any shirt or apparel you want. Have your own logo, want more info on a shirt idea need a quote on a Custom order just click here and fill out the form and we will get back with you within 24 hours.